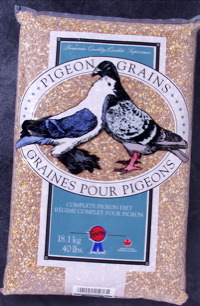 #3 is an all-purpose mixture for large pigeons such as Homers and Kings. The high fat content, combined with a reasonable protein level and good fibre count, make this an excellent winter food. #3 provides you with a low cost, high value formula which can be used in all seasons. While not designed as a racing feed, it will prove to be a winning mix if supplemented. #3 was not designed for smaller breeds of pigeons. The presence of Dent corn and Faba beans make it unsuitable for the small beaked birds. Wheat (hard western), dent corn, popcorn, milo-red, white Peas (small), faba beans, maple and/or austrian Peas.